Smitten by the style of the 1920s. 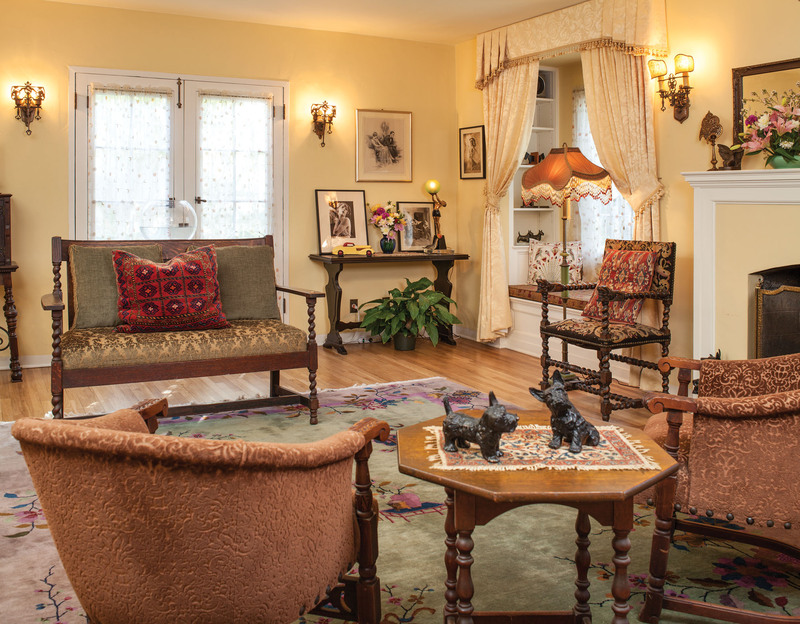 The living room has an engaging, Roaring Twenties ambience with sunny yellow walls, a period revival settle and chairs, and Art Deco lighting. 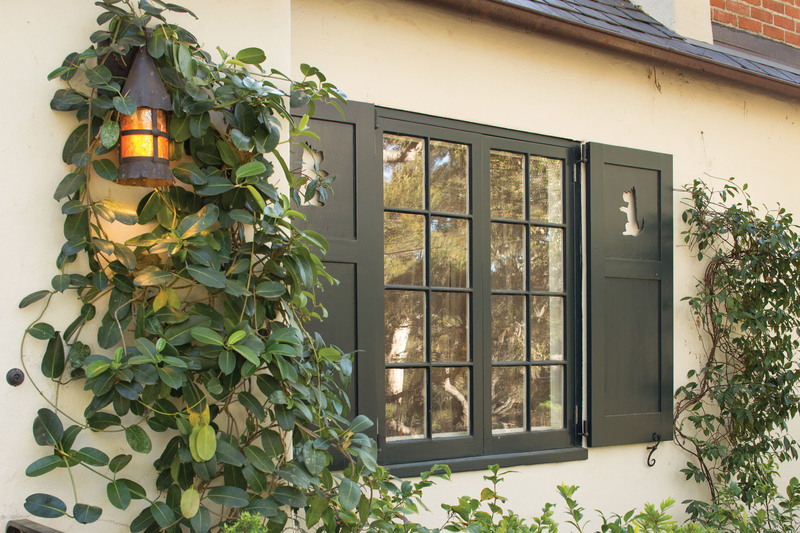 Having finished the restoration of a bungalow, this California couple moved on to a 1925 Norman Revival cottage, bringing it back to life with period themes and whimsy. They collected vintage furniture, pastel Chinese rugs, and unique lighting fixtures, surrounding their finds with the colors of the period to create light-hearted, comfortably modern rooms. 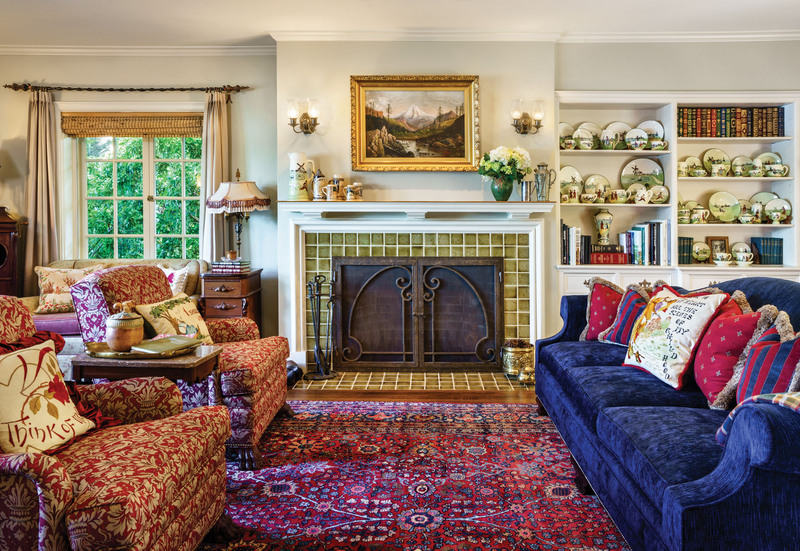 Happy with their 1912 bungalow in Santa Barbara, Patricia Chidlaw and Robert Sponsel weren’t really looking—until, on a walk through Rocky Nook Park above the city, they came upon an attractive house for sale. 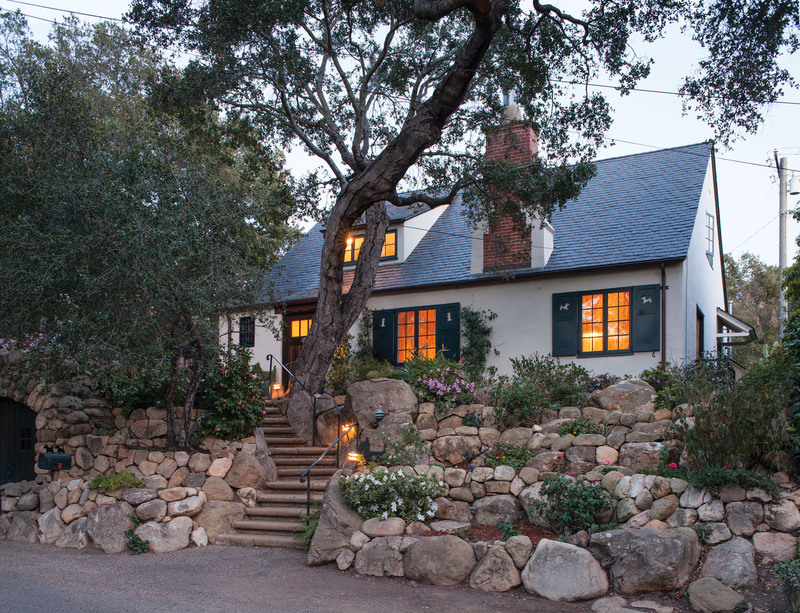 Unlike their more urban home, this vaguely French Norman cottage, built just after the major earthquake of 1925 that shaped modern Santa Barbara, was in a sylvan setting of century-old oaks and tumbled boulders. The house was remarkably intact, with original stucco and a stone garage, and the original layout of rooms inside. Before they knew it, the couple had embarked on their second restoration. 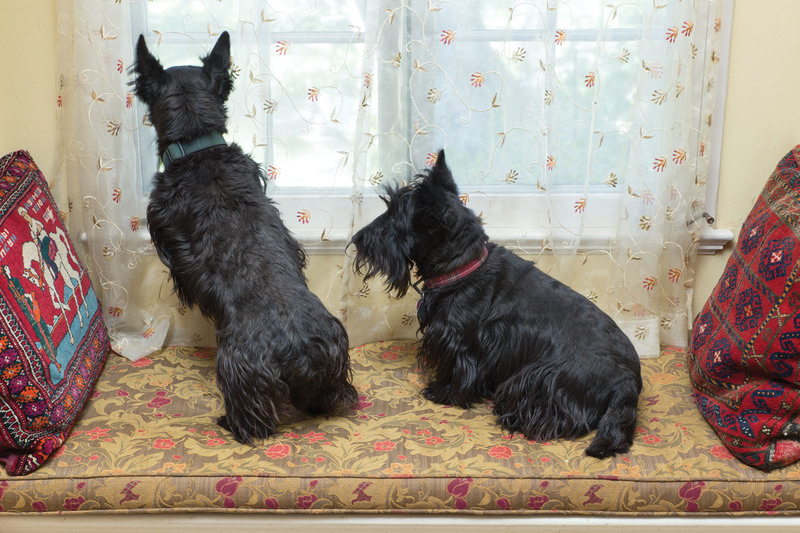 These homeowners specified Scottish terrier-shape cutouts for the cottage shutters. The porch light is from Steven Handelman Studios. The romance of the house was perfect: steep roof and prominent chimney, double eight-light casement windows with built-in seats, a candlestick-phone niche tucked into hall plaster. Big projects to bring it back included a new roof—real slate, as it had been originally, to replace the composition shingles. A new dormer added light upstairs. Trim was painted a deep rich green to complement the pearl-white stucco. 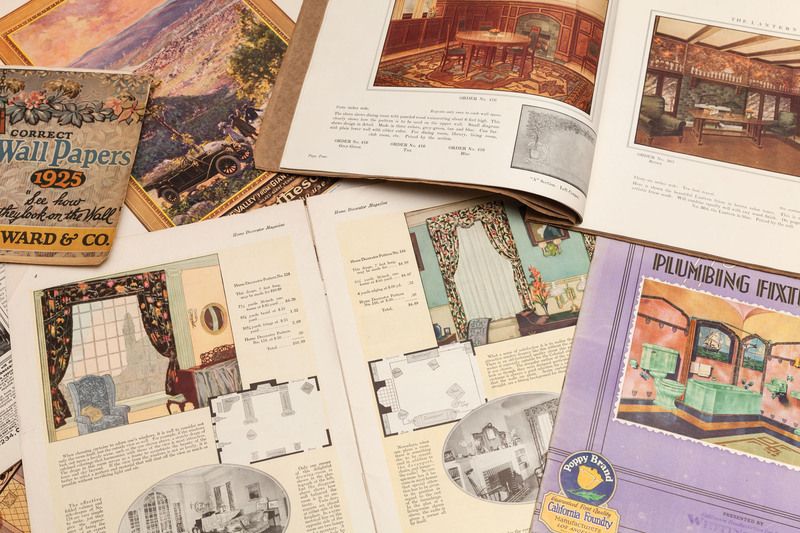 Architectural catalogs of the era emphasized picturesque details, including cutouts in the cottage shutters. 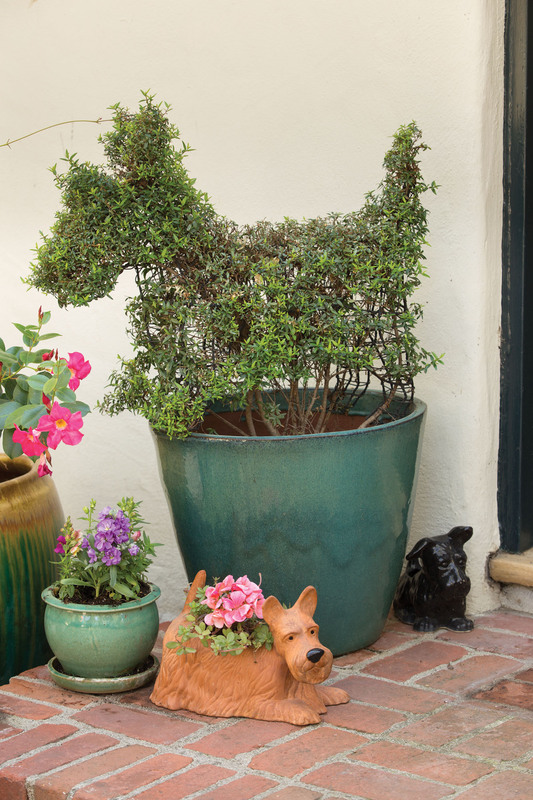 Patricia and Bob picked Scottie-dog cutouts, having named the house Scottie Cottage—not only after their beloved Scottish terriers Fergus and Heather, but also because Scotties were a recurring theme during the 1920s through the 1940s—when F.D.R.’s Scottie, Fala, was “the most photographed dog in the world.” A Scottie theme showed up in the period’s fireplace andirons, bookends, lemonade glasses, and tea towels. Admitting they were not well versed in this style period, Patricia and Bob read old magazines and catalogs they picked up at flea markets and tag sales. The furnishing scheme began with a simple sofa and side chairs in Spanish (or Jacobean) Revival style, with barley-twist legs and old-world upholstery. A period illustration in a 1927 issue of Better Homes and Gardens magazine inspired the round oak table in the dining room. Lighting design really came into its own between the Wars, as colorful and ornamental or figural fixtures replaced the utilitarian electric lights of the early 1900s. The couple found polychromed Art Deco sconces for the living room. The playful pendant with sparrows perched on a wisteria vine (complete with vintage “grape” bulbs) hangs in the upstairs hall. A graceful bridge lamp (illuminating a game of bridge or Mah Jong) is settled in the living room. Its beaded, pleated-silk shade and colorful jade glass insets nod to the allure of the Far East. Patricia and Bob found a round aquarium and stand to put in the window and a pair of 1930s Texaco Listening Scotties, posed with ears cocked as they purportedly listen to an engine running smoothly on Texaco gasoline. Main rooms are now aglow with 1920s decorating and furnishings . . . but the couple aren’t quite done. Their plans for the bathrooms call for mosaic tiles and colored fixtures. As morals and manners changed, householders unshackled their rooms, too. 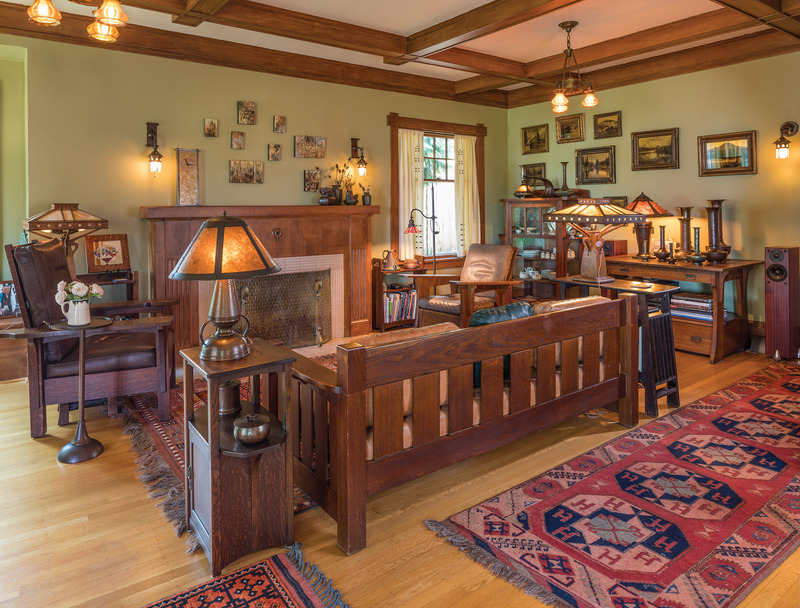 The formality of the Edwardian era and the “honest simplicity” of Arts & Crafts interiors were fading. Interpretations of historical styles were favored, including Tudor and Jacobean, Queen Anne, and Spanish Renaissance, though houses and furnishings alike were only vaguely reminiscent of original styles (thus names like “Mock Tudor” given to 1920s pieces). A ca. 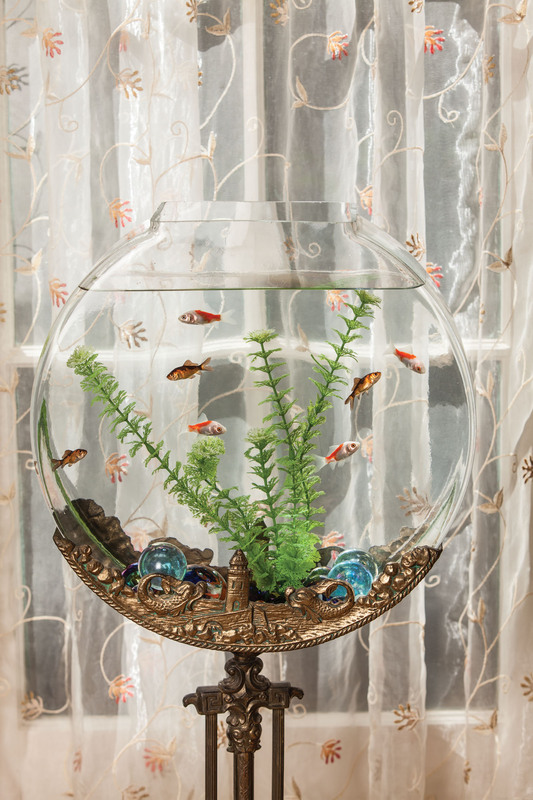 1930 stand aquarium sits before the living room’s French doors. The canteen bowl is a period-style replacement. Burrows explains that furnishing fabrics ran to plain silks and linens, patterned chintz in the English style, and rich-toned velvets. “The overall simplicity of room arrangements, and careful selection of decorative accessories, suggests the continuing influence of the Arts & Crafts movement,” he says. New furniture forms arrived with new technology. Electricity was becoming commonplace, so special “end tables” were designed to hold electric lamps. Davenport tables, telephone chair and table combinations, and smoking stands were soon everywhere. It wasn’t until the mid-Thirties, however, after Prohibition was repealed, that the icon of the American living room—the low cocktail table—made its debut. —B.D.C. Nestled among oak trees and boulders, the picturesque French Norman Revival cottage has become part of the landscape. Stone steps were salvaged from a mission damaged in the 1925 earthquake. 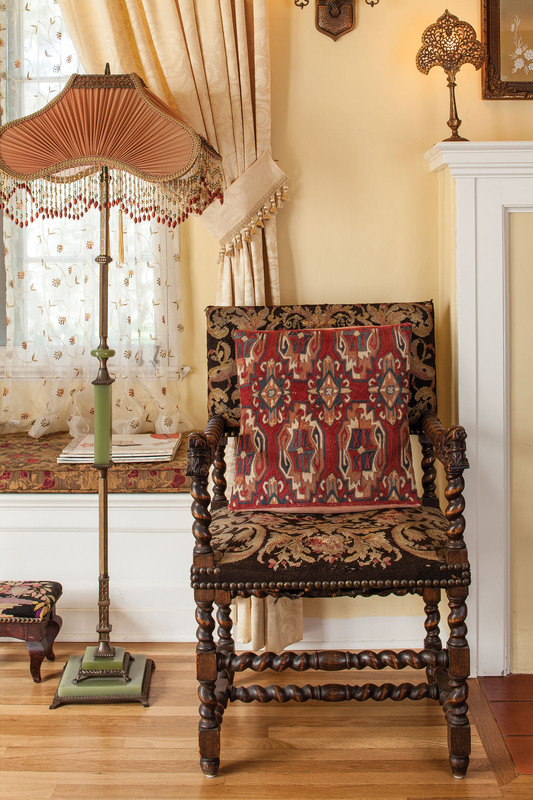 The homeowners used vintage magazines and catalogs to learn about period design and decorating. below Nestled among oak trees and boulders, the picturesque French Norman Revival cottage has become part of the landscape. Stone steps were salvaged from a mission damaged in the 1925 earthquake. Some common motifs marked the interiors, however. First is a return of traditional elements such as columns, brick hearths, and classical trim. A “historical chic” was popular—decorating schemes inspired by 18th-century Italy or the reign of Louis XVI. The nostalgic “Old Colonies” style, a hybrid of English Art Movement and just-stirring Colonial Revival tastes, gave way to a more correct, classical Colonial Revival, which became “Early American” after the restoration of Williamsburg in 1937. The pastiche style of the late 1920s through 1940s was eclectic, historical and yet modern, plush and layered. Rosewood furniture from the attic mingled with tropical palms and period revival pieces. The dining room is set with a sturdy oak pedestal table and Spanish Revival, leather and oak chairs. Dry-point etchings of Scotties are by Marguerite Kirmse, an illustrator of the period who favored dogs. The cupid chandelier was found in neighborhood trash. 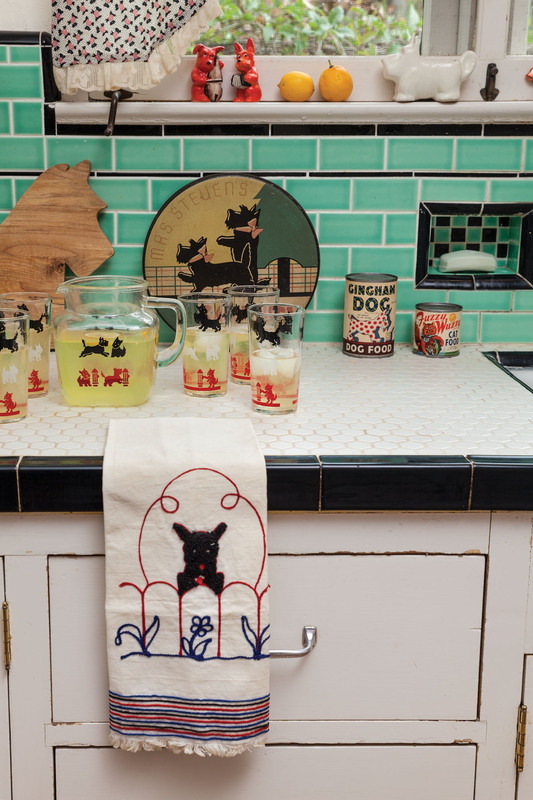 Scottie collectibles include a lemonade set, salt and pepper shakers, and a tea towel. These owners added the period-perfect 1" hexagon-tile counter and Art Deco green tile backsplash with black trim. These modern kitchens were about convenience and an invasion of color. 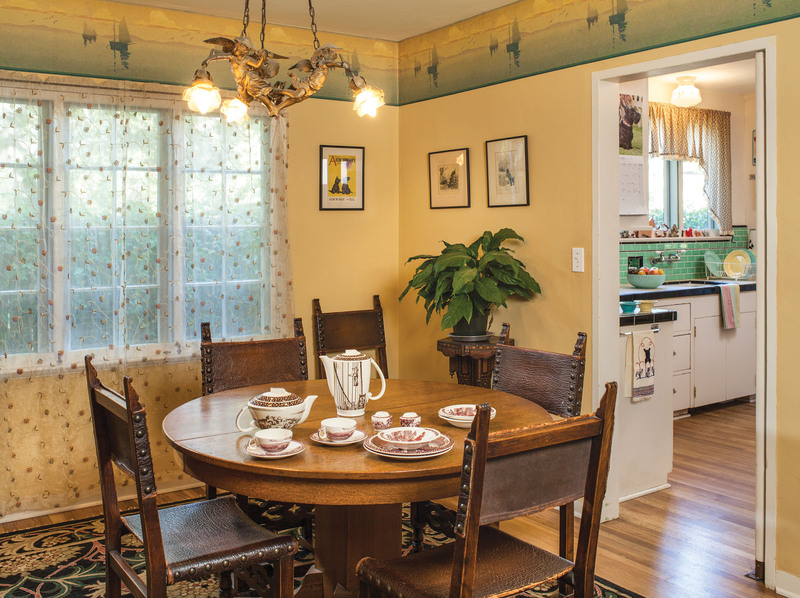 The cozy breakfast nooks of the bungalow era remained in evidence, often with built-ins set in an alcove. But the style was no longer Arts & Crafts: dainty ash and veneered chairs were used with painted tables in the nook. “Is your preference seagull gray, Chinese red, canary yellow, kingfisher blue or pheasant green?” asks a period advertisement. A Hoosier cabinet that kept food preparation supplies in the kitchen, not in the pantry, was often a focal point, painted in a pastel green and ivory combination. Decalcomania (decals) and stencils decorated kitchen furniture and glass lighting shades with flower baskets and parrots. Even the kitchen utensils took on a cheerful note, famously painted green or red with ivory pin striping. —B.D.C. Facing tilted porch piers and baby-blue woodwork, a smitten owner brings the Arts & Crafts aesthetic to a 1921 bungalow in Seattle. In the Pacific Northwest, a unique house with a stone chimney and tower and board-and-batten siding nestles in a fir and hemlock forest above a secluded ravine. 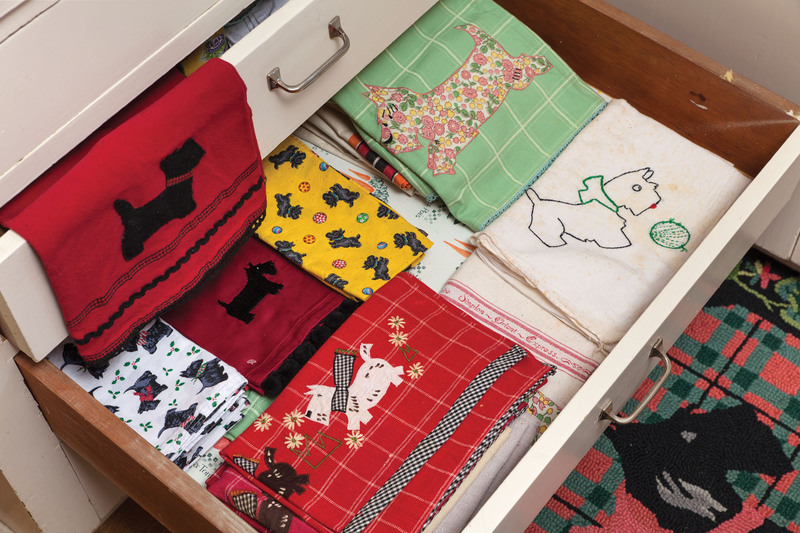 It’s a whimsical mix of Swedish and Norwegian details rendered in a rustic Arts & Crafts style. The Portland family wanted to live someday on Lake Oswego. 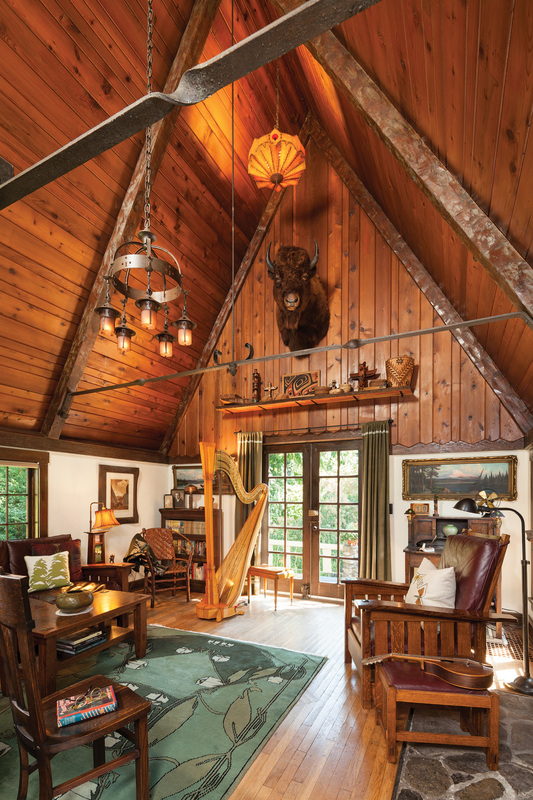 When they stumbled upon a 1927 shingled cottage with Arts & Crafts stonework, it felt like home.